Maybe by now you have already figured out something but ehre are my thoughts: Was your cake completely cool before starting? Is it the top shell border you are concerned about? If it's the top border, the I suggest you carefully scrape it off and do it over - and put if a tiny bit farther on the top edge - so it's not right on the very edge. No :) I have done many 100s of b'cream cakes - that never has happened. If they were thick fondant or gp dots maybe:) Do let me know how it fares over night and thru delivery. My only other thought is maybe it isn't the icing but that the cake itself has fallen apart but if you pushed the 'slope' back up I guess that isn't the case either. The only time I have had that happen was due to high humidity. I learned the hard way that when the weather is really humid...as it usually is in South Carolina, even in winter, that I have to begin working several days ahead of time to give the icing time to set. I even give the crumb coat at least a few hours before adding the first layer of buttercream. Once the cake is iced, I have to let it set up for at least 12 hours before even thinking about adding piping or decorations. Then another 12 to 24 hours before delivering the cake. I've tried all different kinds of buttercream and nothing worked. Finally learned to adjust my working schedule. Tried putting cakes in fridge to speed up the process...Nope! Room temp is your friend if you have the time to spare. And that is tough if not a professional baker and just a hobbiest like me. Hope this helps a little in the future. you may make your scales much thinner. Just roll them out really thin, let it dry a bit before you cut them. 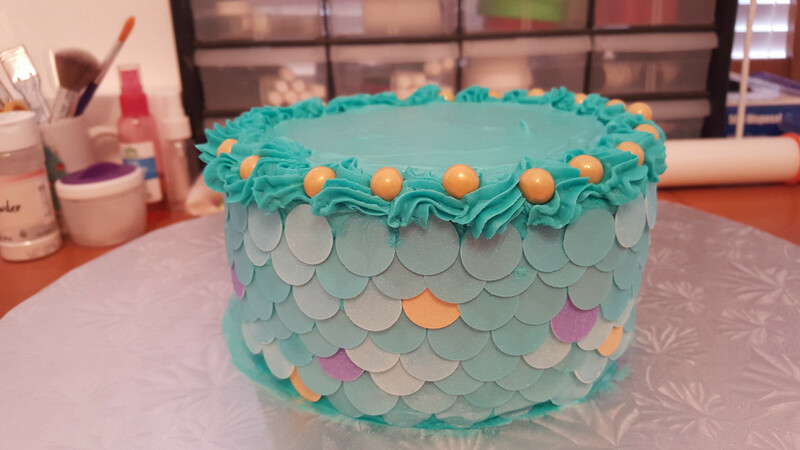 put a thin layer of fondant on the whole cake before you glue them on. It just takes a bit of water for glue when you put it on fondant. or instead of whole circles, you can cut the weight and mass down by using little fondant scale cutters. 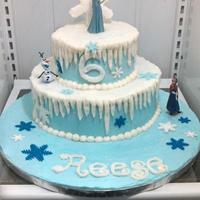 When you pipe borders close to the edge like that you need to make the icing thicker. I've had icing to slip off the cake and it's usually one of two reasons. Either the icing us too soft or there's too much icin on it. Hope this helps! Be blessed!